← Brussels – What to see and do? In all parts of the globe authoritarian forces are in progress. In the capital of India, an important battle is happening and its outcome matters for all those who believe in freedom and equality. 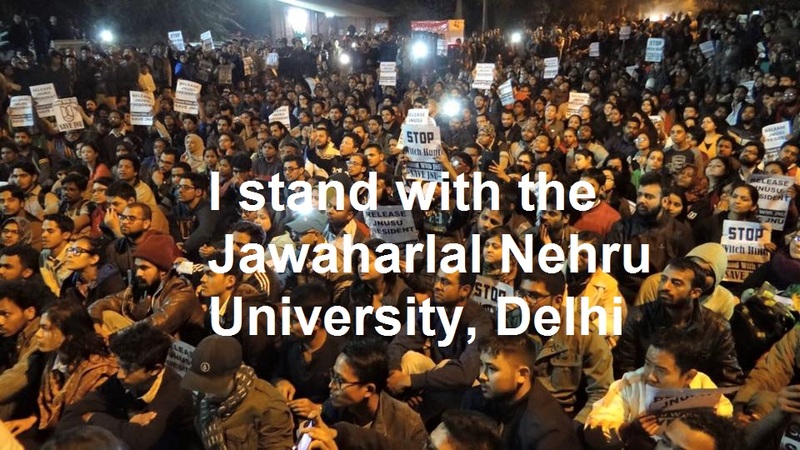 Jawaharal Nehru University (JNU), one of India’s finest and most progressive universities, is being violently targetted as an enemy of the nation by supporters of the right-wing, Hindu nationalist government, the BJP. As former foreign students of JNU, now living abroad, we want to express our support for JNU. There is no place anywhere else in the world like this university. JNU allowed us to study in the best conditions, with outstanding infrastructures and professors, brilliant students and a vibrant social life. Years and months spent in JNU have proved crucial in our intellectual, professional and personal trajectories. They allowed us to develop ourselves through openness and engagement. They enabled us to go beyond western clichés on the “third world” and “the other” as we found in JNU a place way more advanced than what we had ever seen before. What is so unique about JNU? The University is an open-air theatre of democracy in its purest form. JNU gathers students, teachers, workers from all parts of the country and of the world. Everybody on the campus interacts, demonstrates, and shares ideas. They do not all agree, indeed. But they make their voices heard, they believe in the possibility to change others’ minds through debate and action. Unlike in so many other places where words seem to suffice to political engagement, JNU transforms slogans into practical action. On campus, it is not rare for students demonstrate along with toilet workers who want to defend their right, or to stand in committees against violence on women before going to class. JNU is an island of political, scientific, cultural and social progress in a world going through turbulent times. As human societies are overrun by the pace of change, they are more and more tempted by nationalist and authoritarian reactions. This is true in New Delhi, but this is also true in Paris, where our rights to dissidence are also under threat. In December last year, during the global climate conference, 24 environmental activists were deprived from their right to move and forced to stay at home by the police. At the same period of time, security forces raided 3 000 homes, often in the middle of the night, to look for terrorists after the attacks which struck the city. In 99.9% of cases, police forces could not find anybody connected to terrorism. They left broken doors and shocked families behind them. The risk of an authoritarian State is real even in old democracies. And in Paris too, the dark side of nationalism reappears with hideous laws being debated, through which bi-nationals would symbolically become enemies of the nation. Paris is not Delhi. But the strategy of the ennemies of democracy is everywhere the same : unify around a dangerous and outdated conception of nationality, and progressively deprive any right to dissidence. Because we believe in the force of education through openness, through convictions and dissent, we stand with JNU. We do this with rage and love, not only for New Delhi, but for all those who stand against the attempts of the ultra nationalists to stifle dissent and suppress differences. We call for an immediate end to the police action against students on campus, and withdrawal of all charges against Kanhaiya Kumar, President of the JNU Students’ Union. We further demand that the Central Government put an immediate end to its prejudiced persecution of student activists on campuses across the country. This entry was posted in EN - English, Indien, Politik and tagged democracy, India, Jawaharlal Nehru University, JNU, protest, students. Bookmark the permalink.